During their final regular meeting of the season (5/5/09), the Spearfish Area Historical Society elected officers for 2009-10. The group meets monthly at the Senior Citizen's Center, but takes a break during the summer months. Click on the image at right in order to see a larger version. These are the familiar faces of some dedicated members who were elected by acclamation. 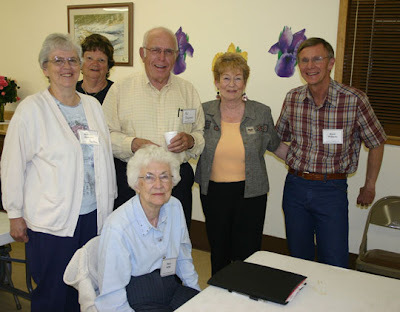 Seated in front is Mary Selbe, Secretary; others (left-to-right) are: Dorothy Honadel, Treasurer; Cheryl Miller; Paul Dingeman, Vice-President; Callie Houghton; and Rand Williams, President. Not pictured is Laurie Hayes, Programs. Linfred Schuttler drew another full house for his program on Prohibition in South Dakota. We'll post information and photos in the next few days. For those of you who've not visited this site before, simply click on Spearfish Area History Postings in the left-hand column to read past postings about meetings of the Spearfish Area Historical Society and related topics. Photographs, along with additional information about past society programs, can be found by clicking on Spearfish Area History Gallery.